The United Steelworkers at the beginning of the 21st century barely resembles the mostly-male industrial union of the 1930s, ‘40s and ‘50s. But the increasing diversity of the membership has only strengthened the basic principles on which the union was founded. Workers employed in the steel industry and in mining – two of the union’s traditional jurisdictions – total about 65,000, out of a total membership in Canada of 250,000. Steelworker members can be found in every sector of the economy – from factories to offices, to hospitals, university campuses, hotels, warehouses, bakeries, banks, transportation and communication workers and many more. More than 20 per cent of Steelworkers now are women, and there is a growing membership among visible minority workers. That all changed with the rise of industrial unionism – a movement to organize and unite all workers in mass-production industries. It was a strategy that gained momentum with the US-based Congress of Industrial Unions (CIO), which formed various organizing committees, among them the Steelworkers’ Organizing Committee (SWOC). It was a strategy without borders, and it gave rise to international unions like the United Steelworkers, the United Auto Workers and many more. With an initial budget of $500,000, the loan of 150 organizers recruited from CIO unions, and with headquarters in Pittsburgh, SWOC launched its campaign in June, 1936. 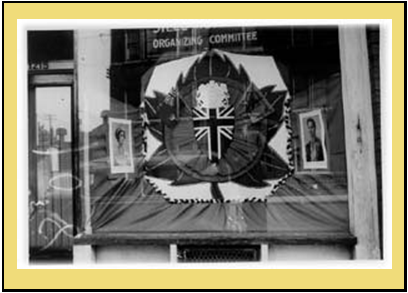 In Canada, SWOC organizing began from the Labour Temple in Hamilton. Steelworkers in Nova Scotia organized most quickly under the leadership of Silby Barrett and the union signed contracts with the company that eventually became Sydney Steel. That achievement made Local 1064 the earliest Steelworker local in Canada. In 1940, an independent steelworkers’ union at Algoma in Sault Ste. Marie, ON, affiliated with SWOC, and the union also began organizing small fabricating plants. In Hamilton, Local 1005 was organized at Stelco in 1936, but, it took several years to gain management’s recognition of the union. With the growth of the steel industry during the Second World War, steelworkers continued to organize and the union’s foundation was built. 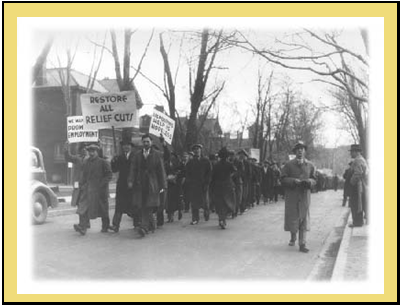 By May, 1942, SWOC had organized 700,000 workers in Canada and the US. It was time to take the next step. At a convention in Cleveland, delegates voted unanimously to adopt a constitution and change the name to the United Steelworkers of America. Although the structure has evolved over the years, the Steelworkers today maintains a four-member executive of top officers, and 12 geographical districts, each headed by a director. In Canada, there is a national director, Ken Neumann, and three district directors – Steve Hunt, District 3 (Western Canada and the territories); Wayne Fraser, District 6 (Ontario and Atlantic Canada); Michel Arsenault, District 5 (Quebec). Union mergers with the Steelworkers have included the emotionally- and politically-charged merger in 1967 with the International Union of Mine, Mill and Smelter Workers. In Canada, the struggle to win the hearts and minds of Mine-Mill members was most strongly felt in Sudbury, ON, and Trail, BC. Today, the United Steelworkers is a powerful part of both communities, through Locals 6500 and 6600 in Sudbury, and Locals 480 and 9705 in Trail. 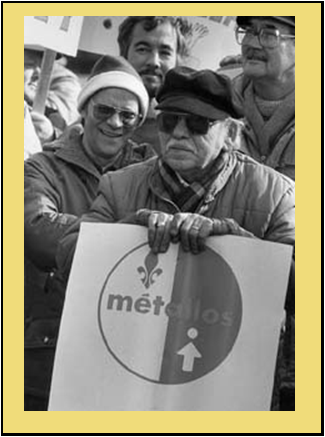 development of the Steelworkers in Canada. At the same time, Canadians are autonomous in their policies and operation. With local autonomy as one of its cornerstones, diversity and strength are enhanced as locals, too, chart their own course. They are supported by a corps of ‘staff representatives’ strategically located in offices across Canada, and a team of staff in the union’s National Office, with specialized skills in research, member education, job evaluation, training, communications, health and safety, and international affairs. The National Office also maintains an in-house legal service. Democracy in the Steelworkers’ union is an important and involved process. Rather than holding delegate-based elections during conventions or conferences, the United Steelworkers uses a referendum process every four years. Each and every member throughout the union is eligible to vote for his or her district and national directors, as well as for the four international officers. Among the struggles that have shaped the story of the union is a classic confrontation between the Steelworkers and the company that today is Stelco. In 1946, the Steel Company of Canada in Hamilton sought to rid itself of a union, which the company believed was imposed upon it only because of wartime conditions. For 10 weeks that year, Steelworkers would do battle with the company, as well as hostile provincial and federal governments. 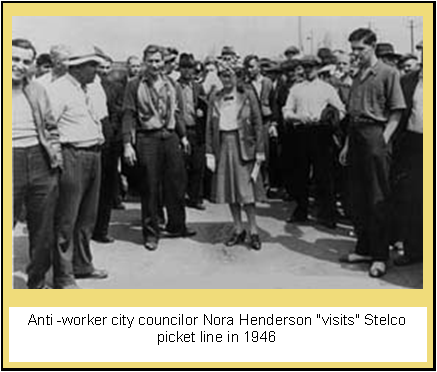 he Stelco strike of ’46 is an integral part of United Steelworkers’ history, as well as the community of Hamilton. With the industry recognized as critical to the nation’s economic growth, a federal ‘steel controller’ had decreed heavy fines and prison terms for those who ignored his orders. The union responded by declaring that: “if they arrest five on the strike committee, five more will take their place until all union members are in jail”. The company brought more than 1,000 strikebreakers (scabs) into the plant, where they were fed and housed. But outside, the “Whisper”, a motor launch used by the union, seriously stopped the flow of supplies from Hamilton Bay on Lake Ontario into the plant. A light plane was used to drop leaflets. The result of this solidarity and ingenuity eventually forced Stelco to bargain with the union, and resulted in a dedicated and informed membership. Though now part of history, the 1946 strike still has some lessons to teach about sticking with the union and creating innovative ways to maintain and improve workers’ rights. Another Steelworker leader, whose roots are traced to the earliest days of the union is Lynn Williams, elected International President in 1984, after serving as District 6 Director, and later as the union’s International Secretary. In the late 1940s Williams helped organize, and was a member of, Local 2900 at Inglis, the downtown Toronto factory that manufactured everything from giant glass tanks for the brewing industry, to bren guns in WWII and pots and pans and fishing rods. The life of Local 2900 and the Inglis plant was chronicled in the book, Working at Inglis, by David Sobel and Susan Meurer. The plant, which in its final days supplied washing machines for the Canadian market of Whirlpool Inc., was one of the first victims of the Canada-US Free Trade Agreement, closing forever in 1989 and demolished a few years later. Local 2900 had a colorful history of legal strikes and wildcats, one even characterized by the downing of tools and the impromptu mass singing of “Solidarity Forever”. Local 2900 stories are also re-told in Working Days, a film by independent producer Darrell Varga. Even today, when word gets out about a Local 2900 reunion, a good turnout is guaranteed. Lynn Williams never forgot his roots and, though retired since 1994, remains active in the union as the president of the Steelworkers’ Organization of Active Retirees (SOAR). Part of the Steelworkers’ evolution has been a unique approach to international affairs. In fact, the Steelworkers’ Humanity Fund became a model for other unions in Canada. The Humanity Fund was established in 1985 as a voluntary, negotiated checkoff for members and locals, with the proceeds directed in the early years to international relief and development, as well as a portion allocated to relief efforts in Canada (food bank donations and natural disaster assistance like the Saguenay and Winnipeg floods, and the 1998 ice storm). The United Steelworkers has never wavered in its support for the New Democratic Party. Steelworkers have been elected as MPs, MPPs and MLAs, and Steelworker activists have been familiar faces in campaigns from coast to coast to coast. Political action for the Steelworkers is vigorously partisan. The union’s roots in this area come through the European experience of direct labour involvement with the parliamentary process. Charles Millard, the first elected Canadian director of the union back in the ‘40s, was among those progressives who understood that to build a strong labour movement, it must work through a party which would seek and protect the goals needed for working people. With the Steelworkers playing a prominent role, the Canadian Labour Congress invited the CCF and other progressive forces to form a new social democratic party in Canada, the NDP. Steelworkers believe strongly in the partnership that is the NDP. The United Steelworkers is everybody’s union. The United Steelworkers is everybody’s union. Our members work in nearly every industry and in every job imaginable, in all regions of the country. Working people choose the Steelworkers because they know the importance of strong, democratic representation on the job. Not only are Steelworkers producing the ore in Canada’s mines and making the steel in the country’s steel mills, they are making railway freight cars, electronics, auto parts, tires, rubber, plastics, aluminum, glass, foam, cement, furnaces, air conditioners, fireplaces, shelving, furniture, mattresses, floor tiles, paints, blinds, watches, potato chips and baked goods. Steelworkers work in banks and credit unions, legal clinics, nursing homes, hotels, restaurants, cafeterias, warehouses, manufacturing plants, mines, steel plants, security companies, call centres, universities, offices, trucking companies, fish plants, airports and resorts.Steelworkers are men and women of every ethnic background in every industry and job. We are proud of our diverse membership – it represents the diversity of Canada. Every Steelworker has a voice and a vote because it’s the members who run the union.Our union represents men and women at more than 1,500 workplaces across Canada. Local unions are created by employees – just like you – who decide to join together to bargain a better deal. That means more job security, a healthier and safer place to work, benefits, and an end to unfair treatment. Steelworker collective agreements across Canada have set patterns for thousands of workers. The best pensions in Canadian industry have been negotiated by the Steelworkers. Anti-discrimination clauses in our contracts pre-dated human rights legislation by decades. The union also negotiates protection for workers against sexual harassment in the workplace. The Steelworkers has negotiated major collective bargaining breakthroughs like fully-indexed pensions, union-selected worker health and safety inspectors and innovative health care benefit programs. The Steelcare Life and Health Benefit Plan is a union-operated, non-profit plan, which provides health and insurance benefits like life insurance, prescription drug coverage, vision care, extended health care, dental benefits and long term disability insurance for Steelworkers across Ontario and Canada. Our Solidarity Forever song is one way to show our unity during events. here’s a historical video of the original Solidarity Forever song of the Steelworkers.